Assuming an even division of assets post the divorce, MacKenzie might gain enough clout to change the e-commerce giant's ownership structure. Apart from a likelihood of shaking up the world billionaire hierarchy, Amazon founder and CEO Jeff Bezos' recently announced divorce with his wife, MacKenzie, may also usher in changes in the e-commerce giant's ownership structure and a dilution in his control. Bezos, the world's wealthiest man with a net worth of about $137 billion, owns around 16% stake in Amazon, as per regulatory filings. In fact, he is the largest shareholder in the company, followed by Vanguard Group and BlackRock Group Inc., each with a little more than 5% stake, The Wall Street Journal reported. While MacKenzie reportedly does not hold any Amazon shares directly, she could be entitled to 50% of the couple's wealth accumulated during the marriage depending on where they divorce, unless they have a prenuptial or postnuptial agreement in place. Significantly, Amazon was launched a year after the couple got hitched. MacKenzie, moreover, was a key member of the Amazon team in its first year of operations. So, assuming an even division of assets, she could walk away with a chunk of Bezos's stake in the company, currently worth around $130 billion. This means that she will become the world's richest woman, possibly with enough clout to influence shareholder votes on resolutions and even press for changes at Amazon. The CEO would have to flag any plans to split up his stake as part of the divorce proceedings ahead of normal regulatory disclosures to the extent such knowledge could affect the board's decision-making. Logic stands that MacKenzie would want the family fortune to continue to grow. And since that is tied in large part to Bezos' control of the company, she is unlikely to push for a settlement that would require him to sell shares and dilute his control on Amazon. "I don't think there is an issue of concern for shareholders as to what will happen to Amazon because of the divorce," Liat Sadler, a San Francisco matrimonial lawyer, told Reuters. According to her, the main options facing the couple regarding Amazon stock were for Bezos to buy out his wife, or for MacKenzie to retain shares. The assets that will come into play during the divorce proceedings reportedly also include real estate properties across the country, including a $12.9 million residence in Beverly Hills, Calif. and a $23 million former museum in Washington, D.C., and two other companies that Bezos owns. He founded space company Blue Origin in 2000, and is funnelling more than $1 billion a year of his own fortune into pulling it out of start-up mode and into production. He also acquired The Washington Post in 2013. In addition, the couple had picked up pace on the philanthropy side in recent years. In September, they had committed $2 billion through the Bezos Day One Fund to helping homeless families and starting pre-schools for low-income communities. Last January, they had donated $33 million to fund college scholarships for US high schoolers under Deferred Action for Childhood Arrivals program, which has shielded nearly 800,000 young immigrants - including thousands of India-origin - from deportation. The duo's joint efforts reportedly also included a foray into politics, when the couple contributed $10 million to a super PAC that helps military veterans get elected to Congress. If the couple indeed follows through on pursuing joint ventures, as their joint statement announcing their decision to part ways claimed, then the division of assets could get complicated. 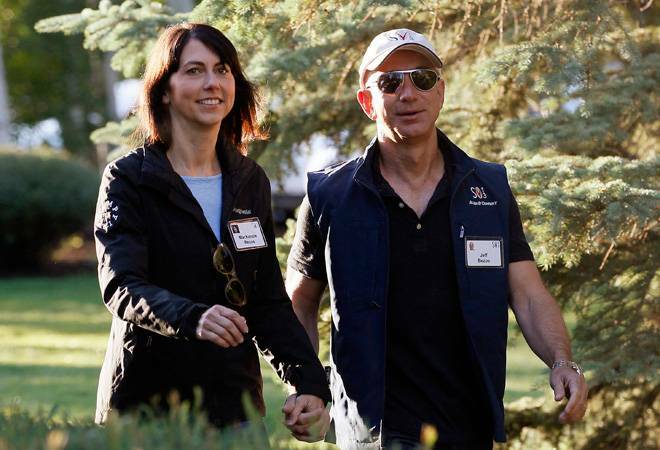 "'We've had such a great life together as a married couple, and we also see wonderful futures ahead, as parents, friends, partners in ventures and projects, and as individuals pursuing ventures and adventures," read the statement put out on Twitter by Bezos on Wednesday. However, past high-profile divorce cases involving corporate heads don't paint a rosy picture. For instance, after Wynn Resorts Ltd. founder Steve Wynn and his wife Elaine got divorced in 2010, she eventually ended up as the casino company's largest shareholder and he was ousted from the CEO's chair. Elaine then pushed to restructure the company's board. In 2012, Frank McCourt, Chairman and CEO of McCourt Global, was forced to sell the Los Angeles Dodgers baseball team in 2012 after a messy divorce and mounting debt on the team.